Single malts have been the driving force behind the resurgence of Scotch whisky and its worldwide boom. At least one whisky company, however, is convinced that blended Scotch whisky is also on the verge of a resurgence. Global brand Dewar’s is preparing to back that conviction with a multi-country, global media campaign designed to double its U.S. sales of blended Scotch whisky in the next year. Themed “Live True,” the $15 million global marketing campaign emphasizes the brand’s obsession with doing things twice to make them better. The theme is also a nod to Dewar’s double-aging process. Running through the end of 2019, the multi-market effort features a new TV anthem with Scottish actor Iain Glen, well known for his starring role in the hit HBO TV series Game of Thrones, as well as print, digital/social and out-of-home (OOH) executions. “Live True” will debut in the U.S., before rolling out across Spain, Puerto Rico, the Dominican Republic and Lebanon, amongst other countries. The campaign re-launch kicks off the brand’s larger strategy to fuel growth across its entire portfolio, with a renewed focus on innovation, as well as its approach to retail, sampling and merchandising. 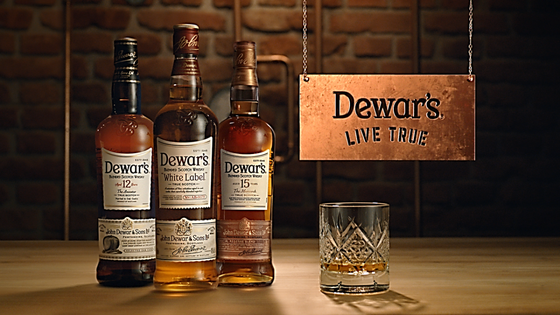 ‘Live True’ is a bold embodiment of Dewar’s as a brand. We stick to our convictions and continue to double-age our whisky because we know it makes for a better, smoother taste. This campaign is just the beginning to robust global efforts to lift the veil off not just Dewar’s, but the Scotch whisky category as a whole, showing the craftsmanship and approachability behind this storied spirit. Starting October 22, the new “Live True” TV spot will air across on-demand video services, as well as national and global entertainment, sports and news networks, including Comedy Central, CNN, ESPN, FX and Hulu. In addition to TV, Dewar’s will run double-paged print ads in more than 15 different premium, sports, food, travel and tech publications, including Esquire, Food & Wine, Forbes, Sports Illustrated and Travel & Leisure. The campaign will also come to life through digital and social efforts, as well as OOH executions in major metropolitan cities, including New York, Chicago and Boston. The first globally integrated campaign in five years, and with that the business is doubling down on Dewar’s by revamping the brand’s merchandising program, fueling the growth of its premium marques, and reshaping its on-premise experiential and sampling strategy. With blended Scotch whisky poised for a comeback in the U.S., the time is now for Dewar’s, the most award-winning blended Scotch whisky, to capture the attention of whisky appreciators everywhere. As part of the “Live True” campaign, Dewar’s intends to position Scotch whisky as a modern and approachable spirit. The company intends to reshape its retail, bar sampling and menu strategy to include not just craft cocktails, but “everyday serves” as well. While continuing to champion its infamous Penicillin cocktail (Dewar’s 12, honey, ginger and lemon), Dewar’s is also igniting efforts around the Highball (Dewar’s 12, soda water and lemon twist), which was originally created and popularized in the early 1900s by Tommy Dewar, son of founder John Dewar. The brand is also rolling out a number of new gift packs and playful displays in the off-premise, all with a focus on the whisky’s double-aging process.